Easy Goer seemed destined for greatness from birth. Foaled and raised at Claiborne for owner/breeder Ogden Phipps, the strapping chestnut was out of the Champion racemare Relaxing, and was a son of Alydar, hero of Calumet Farm who finished a competitive second in all three legs of Affirmed’s 1978 Triple Crown. Easy Goer broke his maiden at Saratoga, then won an allowance at Belmont, followed by wins in the Cowdin S. and Champagne S. Those wins appeared almost effortless thanks to his fluid stride, and he was the favorite going into the Breeders’ Cup Juvenile. He did not win that day at Churchill Downs, finishing second to Is It True, but the strength of his victories earned him the Eclipse Award as Champion 2-Year-Old Colt. Expectations were high for his 3-year-old season and Easy Goer did not disappoint. He won the Swale S. in his sophomore debut, covered the mile in a dazzling 1:32 2/5 winning the Gotham S., and then took the Wood Memorial by daylight. Easy Goer’s career was largely defined by his rivalry with the great Sunday Silence. The two first met in the Kentucky Derby. Sunday Silence broke clear at the top of the stretch and pulled away to win, while Easy Goer rallied in the mud for second. In the Preakness, only a nose separated the rivals in one of the greatest races in history, with Sunday Silence winning again. Easy Goer delivered his revenge in the Belmont S., thwarting a Triple Crown bid, and drawing clear to win by eight. That victory began an amazing five-race winning streak in which he also won the Whitney H., Travers S., Woodward H., and Jockey Club Gold Cup in succession. Easy Goer and Sunday Silence met for the final time in the Breeders’ Cup Classic that year, and Sunday Silence prevailed once more, holding off a powerful closing rush from Easy Goer at the wire. At four, Easy Goer added the Suburban H. to his resume and was retired to stud at his birthplace. He had earned $4.8 million, won 14 races in 20 starts, and was never worse than third. His career as a stallion was cut short. 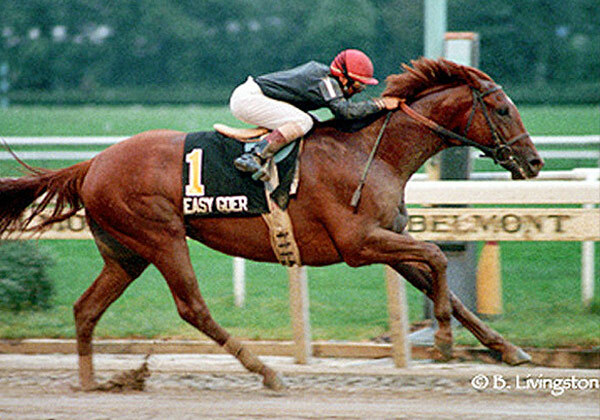 Easy Goer collapsed and died on May 12, 1994. He sired 107 winners, 9 stakes winners, 16 stakes horses from 136 foals. They include Grade 1 winners My Flag, Whitney and Travers S. winner Will’s Way, as well as Ballerina S. winner Furlough. Easy Goer is buried at Claiborne Farm.